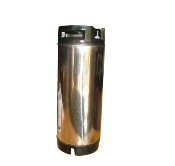 5 Gallon stainless steel used cornelius keg. Ball lock connections. Rinsed and pressure tested. Two hard rubber handles, and rubber footprint.